We have recently moved to Borrowbox, an exciting and innovative collection with a huge range of top titles. 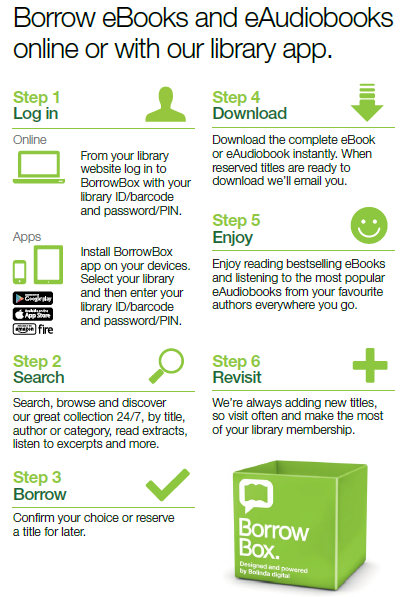 Borrowbox offers a fantastic, yet simple customer experience with a bigger and better selection of ebooks and e-audiobooks to enjoy. Dyslexic font available to increase readability. Whether you are an existing customer or are new to ebooks/e-audiobooks you will love this service – don’t miss out! Our handy guide below explains how to use the service, simply click https://fe.bolindadigital.com/liveargyll and follow the steps.